As a full-time pro for over 25 years, the gear I take on assignment depends on what is needed. Contrary to what it might look like, I prefer to work with the minimum amount of equipment. My personal kit is a Leica Q with 28mm f1.7 Summilux lens. Often, I’ll add a Leica M-E (with new CCD sensor) and a 90mm lens for the option of a tighter crop. If I feel really adventurous, I’ll carry along my DJI Mavic Pro 2 drone with its 28mm fov Hasselblad lens. Being familiar with the gear is most important to me. 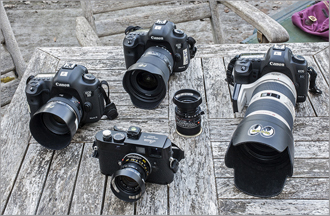 To that end, I’ve always carried some form of Leica in my kit – a camera I’ve used since 1979. After Leica’s R cameras were discontinued in 2009, Canon’s EOS system became my SLR of choice. 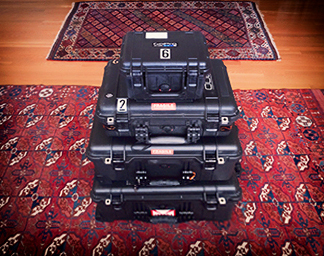 Today, I carry a minimum of three camera bodies for my professional work, each with its own lens attached. My Canon DSLR cameras are normally mounted with Canon EF EOS 16-35mm f/4 IS-L, 50mm f/1.4, and 70-200mm f/2.8 II IS-L lenses. A Canon 250D close-up lens converts the 50mm into a usable macro. A 1.4X extender III makes for a longer and closer focusing telephoto. Specialty lenses like Canon’s 14mm f2.8 EF-L II, 15mm f/2.8 fisheye, 24mm f/1.4 L II, 35mm f/2 IS-II, 24-105 f4 IS-L, and 500mm f4 IS L are also enlisted as needed. Leica’s discontinued 80mm f/1.4 R-lens has the best bokeh around and was adapted to my Canon cameras. The Leica 180mm f3.4 APO-R lens continues to be one of the lightest solutions for a longer telephoto with outstanding rendering, so it’s my back up. One or more Gitzo tripods are implemented with a ball head/pan head and cable release. GoPros and DJI drones are employed for specialized filmmaking and unusual still angles. The Profoto B1X 500 and Godox 600 have proven ideal for portable flash, so a pair or two of these is added to the kit as needed. A pair of Canon Speedlites with modifiers provide supplementary fill. A Zacuto Z-finder and a Rode microphone handle basic video. My Apple Macbook Pro with two Lacie external hard drives is essential. Photography equipment is simply a tool. Seeing and having something to say are MUCH more important. That said, I look for gear that is not only of the highest quality, lightweight, and easy to use, but also produces characterful rendering. Note that there is back up redundancy throughout. After the shoot, the used digital cards stay in a secure holder inside a zippered vest pocket on my person. As soon as I return to my hotel, the RAW files are backed up on my computer, Dropbox, and two hard drives. The drives are kept in different locations, or one is FedExed home. I love what I do, but I’ve also learned not to assume anything.